On 18 December, the Supreme Commander of the Libyan Army, Marshal Khalifa Haftar announced the expiration of the Skhirat Agreement on the subject of national reconciliation, signed on 17 Dec 2015 under the auspices of the United Nations. One of its participants was the government of Fayez al-Sarraj, which lacked support from Parliament and the Libyan armed forces. The agreement, signed in Morocco, was renewable only once and provided for the formation of a government and was agreed to by all parties for a period of one year. Despite the fact that F. al-Sarraj’s government’s term ended on December 17, the UN Security Council stressed that the Skhirat Agreement should remain the only method of resolution of the current crisis in Libya until the general election next year. In a speech on television, which took less than seven minutes, Haftar said: “the legality of this so-called political agreement has expired along with all the structures created with it. The armed forces will not follow the orders of any party that has not received its legitimacy from the Libyan people.” The Field Marshal stressed that supreme command of the Libyan armed forces is in direct communication with the international community to resolve the Libyan situation and offers its vision of the political process and the holding of a general election. 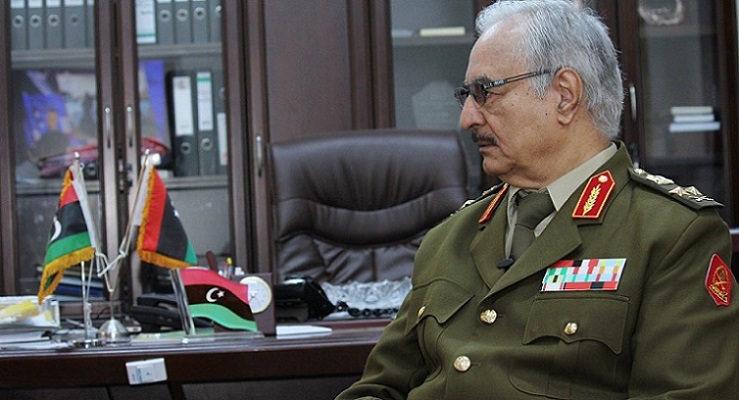 In this way, Haftar confirmed that henceforth, the government of F. al-Sarraj is illegal, having lost the two-year legitimacy it received in accordance with the Skhirat Agreement and that now all power has passed into the hands of the military. This means that the commander of the Libyan army is willing to go into an armed conflict with al-Sarraj if he decides to resist. The latter, being a puppet of the EU, in particular of France and Italy, visited Algeria the day before, where he met with the Algerian Prime Minister. Al-Sarraj stressed that the Skhirat Agreement “has the mechanisms in place for reaching an agreement by addressing any political obstacles” and came out against a military solution to the crisis. On 17 December, a meeting of the Foreign Ministers of Egypt, Tunisia and Algeria was held in Tunisia to discuss the political process and security situation in Libya. The Tunisian Ministry of Foreign Affairs stated that this meeting aimed to provide an opportunity to draw up an action plan on a tripartite level for the upcoming phase, and expressed support for the efforts of the United Nations. The latter took the side of al-Sarraj, even though it was he who was to blame that the Skhirat Agreement was never implemented, and he maintains close ties with extremist groups funded by Qatar. Special representative of the UN Secretary General in Libya Ghassan Salamé said that the United Nations Support Mission in Libya (UNSMIL) has provided the necessary technical support to the High National Elections Commission (HNEC) and is trying intensely to establish the appropriate political and legislative conditions, as well as security for the elections which are to be held before the end of 2018. Under these conditions, the eldest son of Muammar Gaddafi, Saif al-Islam has announced his intention to participate in the presidential elections in Libya due to take place in 2018. According to a representative of Gaddafi, he will present his political manifesto in the near future. In particular, measures that “should help Libya move from a transitional period to a period of stability” will be emphasized in the manifesto. Gaddafi’s return to Libyan politics was reported in mid-October. At the time, his lawyer said that Saif al-Islam had begun to rebuild contacts with community leaders and tribal leaders to form a comprehensive program. In 2015, Saif al-Islam was sentenced to death in Tripoli for war crimes. The trial was criticized by international human rights organizations, due to numerous violations and the fact it took place in the absence of the accused who was in prison in the city of Zintan at that time. However, after sentencing, the leaders of the armed authorities of Zintan refused to transfer him to Tripoli for execution. In the summer of 2017, Saif al-Islam was released from prison under a general amnesty (according to unofficial data, in fact, he could have been released a few months previously). Representatives of the group “Abu Bakr as-Siddiq”, which had held Saif al-Islam prisoner, previously said that Gaddafi was released under an amnesty announced by the Parliament. The Libyan General Prosecutor’s office refused to cancel the warrant for his arrest since the Gaddafi’s trial had been held in absentia and they continued to demand that he appear before the court. An arrest warrant has also been issued by the International Criminal Court (ICC) in relation to Gaddafi and the ICC intends to prosecute him for crimes against humanity, torture and murder of civilians during the civil war. However, Libya does not recognize the jurisdiction of the International Criminal Court; Gaddafi rejects the charges. Most likely, the West will declare Gaddafi’s candidacy illegitimate due to alleged crimes committed. Charges by the ICC for “crimes against humanity” are still outstanding against him. However, this does not prevent him from participating in the election as it is an internal Libyan affair. There is a precedent, when the same accusation was levelled against Kenyan leader Uhuru Kenyatta who won at the polls in 2013. Before Gaddafi announced his participation, experts considered the scenario of an “integrated military structure”; the creation of the military council, through which all active political players solve the problems associated with terrorism. The possibility of the formation of a new government after the elections is not excluded out of hand. If Gaddafi goes to the polls, a new outlook is possible. Skeptics believe that the young leader will not be able to achieve absolute rule in Libya, since he will not be able to collect enough loyalists to resist Tripoli. The tribal militia Warshefana, supporters of Gaddafi, who until recently held control of the areas around Tripoli, met resistance from Zintan forces and, if they were alliesearlier, instead they now are competing for influence over checkpoints and roads. On the other hand, Gaddafi is popular, especially in the southern regions. In the west of the country, business owners would also like to see the successor of the previous stable regime. Nostalgia for the days of Gaddafi’s father is also rife: the image of his father, under whom the country prospered, is carried on by his son. People are tired of war, crime, and fragmented power and want peace. This skepticism disappears if a scenario is implemented in which Gaddafi is able to unify his comrades with General Haftar’s forces, and/or with Zintan and individual factions, in which case Tripoli’s dominance may be shaken. Haftar has good relations with Egypt and the United Arab Emirates, while Moscow maintains a dialogue with him on a par with that of Tripoli. The day before, Haftar was negotiating with the military based in Tripoli, on whom the future of al-Sarraj will depend. In addition, judging by the trends, Tripoli is losing support of the United States. For instance, at a meeting with US President Donald Trump, the prime minister did not achieve more active intervention from Washington or guarantees of personal security. Although the very fact the visit took place indicates that the White House continues to participate in Libya, in reality, with each year we see the strengthening of the positions of supporters of the Gaddafi family. Much now depends on al-Sarraj, France and Italy. If these two countries push the now-former head of the Libyan government to confrontation, Haftar will have to begin military actions, and those behind Gaddafi will support him. It is difficult for Paris to do this, given that a book was recently published in France, in which former President N. Sarkozy is revealed to have taken large sums from the late Libyan leader in the 2007 election, and it was Sarkozy who was the most active leader in fomenting the war in Libya, hoping that the physical elimination of Gaddafi’s family would cover up his financial ties with them. In particular, we are talking about receiving bribes from a foreign state and we should expect the French justice system to react. As for Haftar, besides the Libyan parliament, Egypt and Saudi Arabia who are all behind him, Russia also displays a preference for him and is ready to provide the marshal with military and technical assistance. For Italy, the most important thing is getting contracts for the restoration of the Libyan economy, and it is unlikely that they will want to fight for al-Sarraj. So the odds are clearly in Haftar’s favor. For this reason, he ceased the army’s participation in the Skhirat Agreement.